Volvariella volvacea strains were studied in relation with their ability to produce biomass, lipids and polysaccharides. 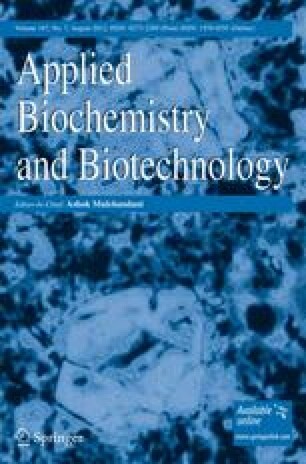 Firstly, screening of four strains (AMLR 188, 190, 191 and 192) was performed in agar cultures, where the mycelial growth rate of the strains was measured, and in static liquid cultures, where the production of biomass, the biosynthesis of total cellular lipids and the consumption of glucose were monitored. For all strains, biomass production was significant (13–15 g l−1) and total lipid in dry weight (%, w/w) ranged from 3 to 12 %. Afterwards, a detailed kinetic analysis of mycelial biomass, extra- and intra- cellular polysaccharides (EPS, IPS, respectively) as well as lipid production by a V. volvacea selected strain was conducted in submerged static and agitated cultures. Maximum values of 15 g l−1 biomass, ∼1.0 g l−1 EPS and 5.5 g l−1 IPS were recorded. Agitation did not have severe impact on biomass, EPS and IPS production, but it increased total lipid in dry weight quantities. EPS, IPS and lipid in dry weight values decreased with time. Glucose was the major cellular carbohydrate detected. Total fatty acid analysis of cellular lipids was performed for all V. volvacea strains and linoleic acid Δ9,12C18:2 was predominant. Neutral lipids constituted the major fraction of cellular lipids, but their quantity decreased as fermentation proceeded. Phospholipids were the most saturated lipid fraction. Diamantopoulou, P., Papanikolaou, S., Kapoti, M., Komaitis, M., Aggelis, G., Philippoussis, A. (2012). Mushroom polysaccharides and lipids synthesized in liquid agitated and static cultures. Part I: Screening various mushroom species. Applied Biochemistry and Biotechnology. doi: 10.1007/s12010-012-9713-9.